Roadshow Entertainment has been pretty sharp in getting content out onto Blu-ray, and it’s good to see that it isn’t overlooking the older catalogue. 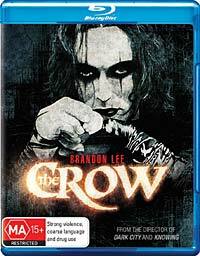 On 3 February 2011 it is releasing Alex Proyas’ The Crow. This is particularly welcome because the movie is a fine work, and to date the only DVD version has been pretty awful in quality (full frame, splotchy, dark grey blacks). For a moment there (and I tweeted as much) I thought that it was also releasing the classic 1974 Australian Bikie movie Stone on 24 February, but it turns out to be slow-moving Norton/De Niro thriller. Update: I stopped reading too soon. Turns out that it is also releasing another classic on Blu-ray: Mad Max (on 3 March 2011). This one will be particularly welcome because the DVD version was hampered by a significant problem with the mastering of its video. I am assuming Mad Max will be 24p – no chance of interlacing the wrong frames. I’ll hold judgement on that until I see it. After all, Pulp Fiction DVD had the same problem. The Blu-ray version looks excellent, but is 1080i50 rather than 1080p24. Still, they did the interlacing right on it, so with good equipment it looks just as good as 1080p24.